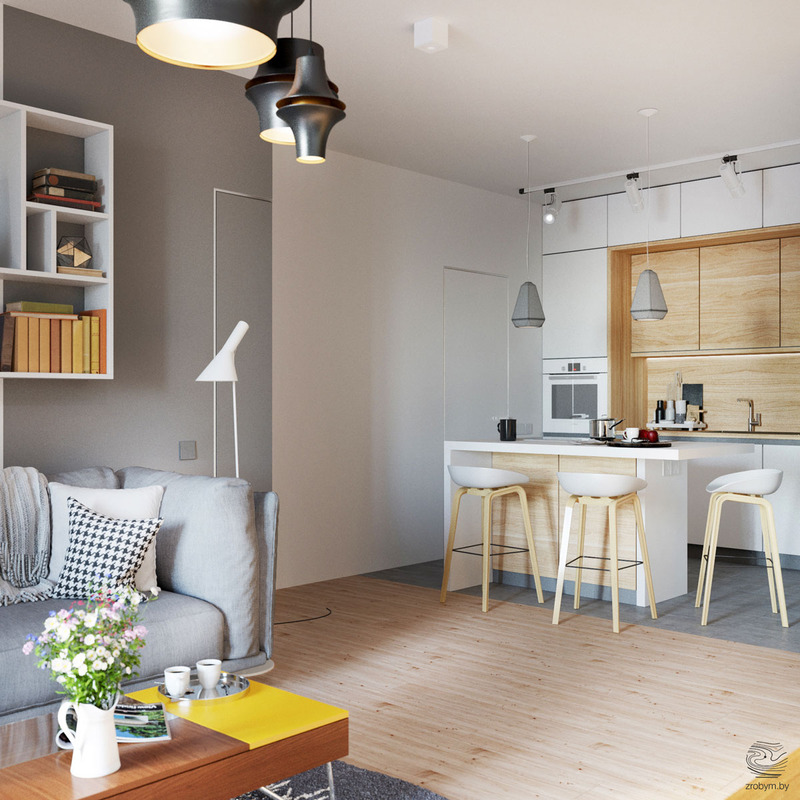 The remodeling of this small flat in Minsk, by designer Zrobym, shows us that small spaces don't always appear tightly stuffed, and that they don't need to be devoid of features and colour to achieve a spacious look. 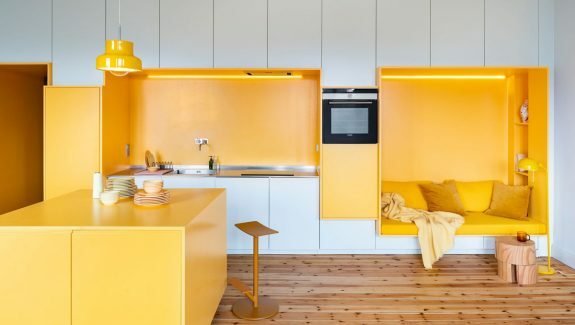 This particular compact home uses pops of solid yellow to tie each area together, without the strong hue becoming overwhelming within the limited proportions. The cheerful accents create several moments of interest, keeping the eye moving around the scheme. 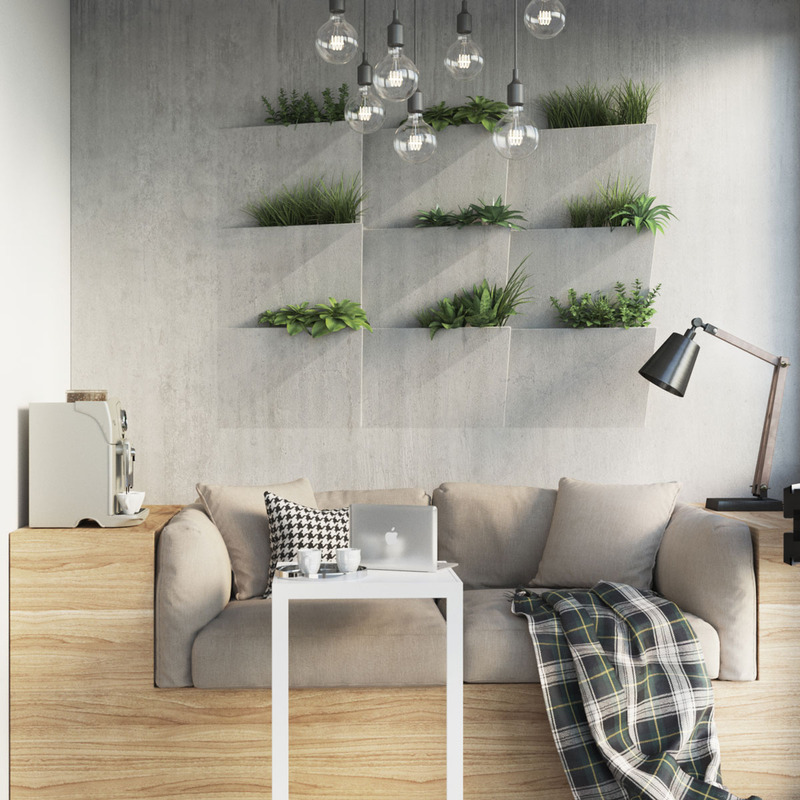 See how the wall space has been used to full effect too, and slimline furniture has been implemented to fill the home with practical options–without overfilling. 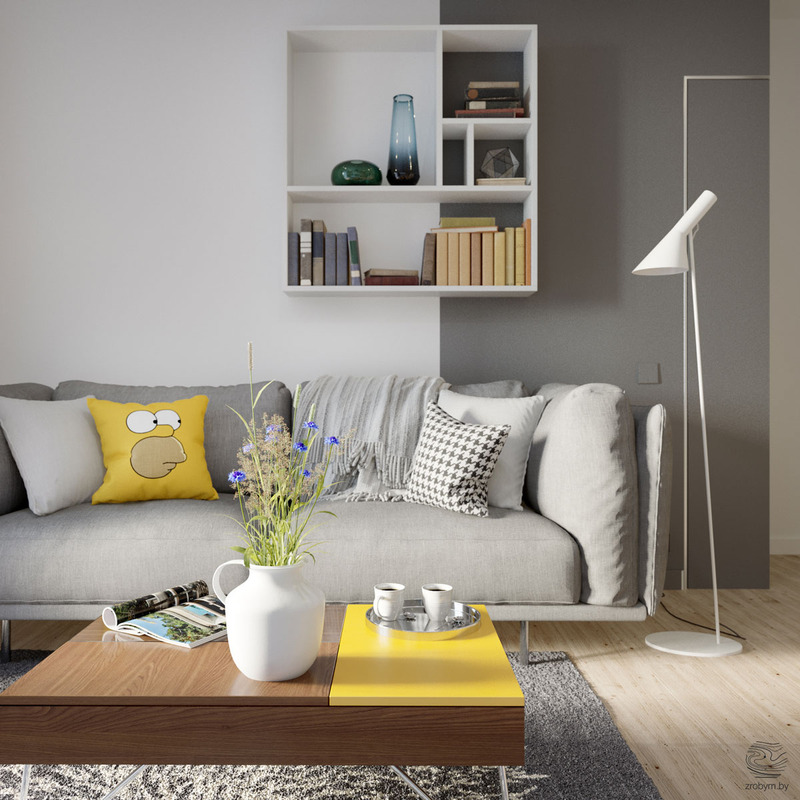 A playful side to the home design comes out in the yellow accent living room, where a Simpson throw pillow brightens up the sofa. The face can be turned to the back for a plainer look too. Decorative vases with a wild floral arrangement are a great way to liven up a coffee table and this clean white jug style vessel suits the simplicity of the scheme well. The sunshine yellow section offers a nice clear space for setting down the coffee mugs. 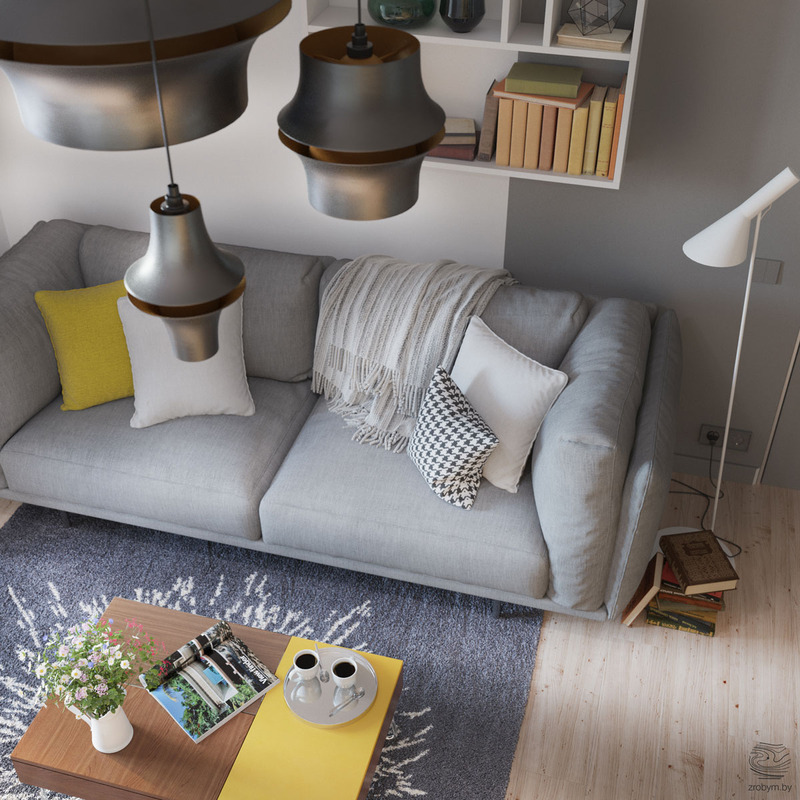 A floor lamp standing over a stack of books on the floor makes the sofa into a cozy reading place. The white AJ Floor Lamp matches the white wall shelf where even more books are stored. 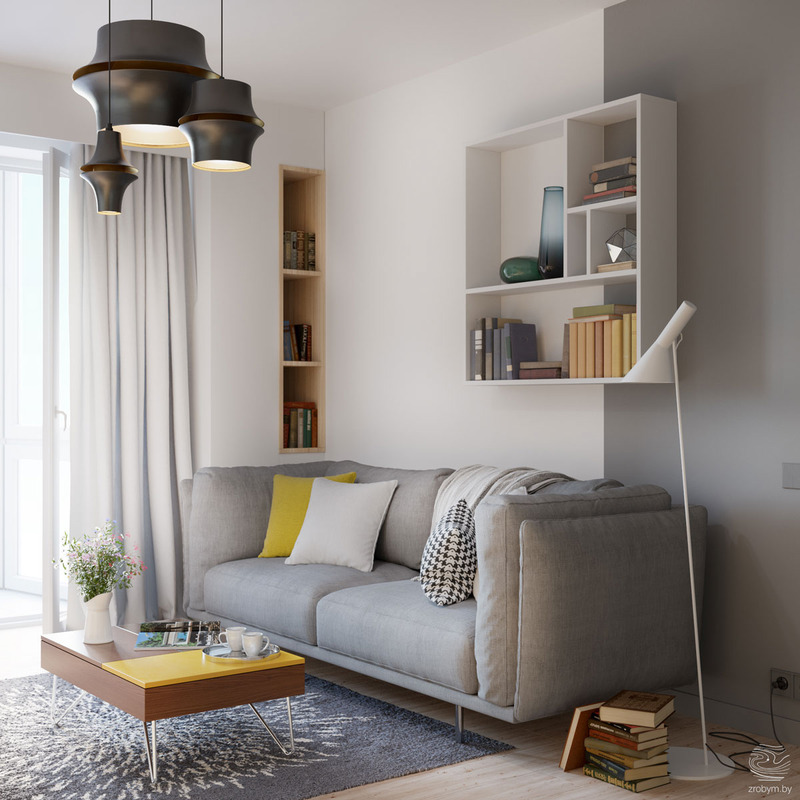 See our living rooms for book lovers for more bookworm inspired spaces. 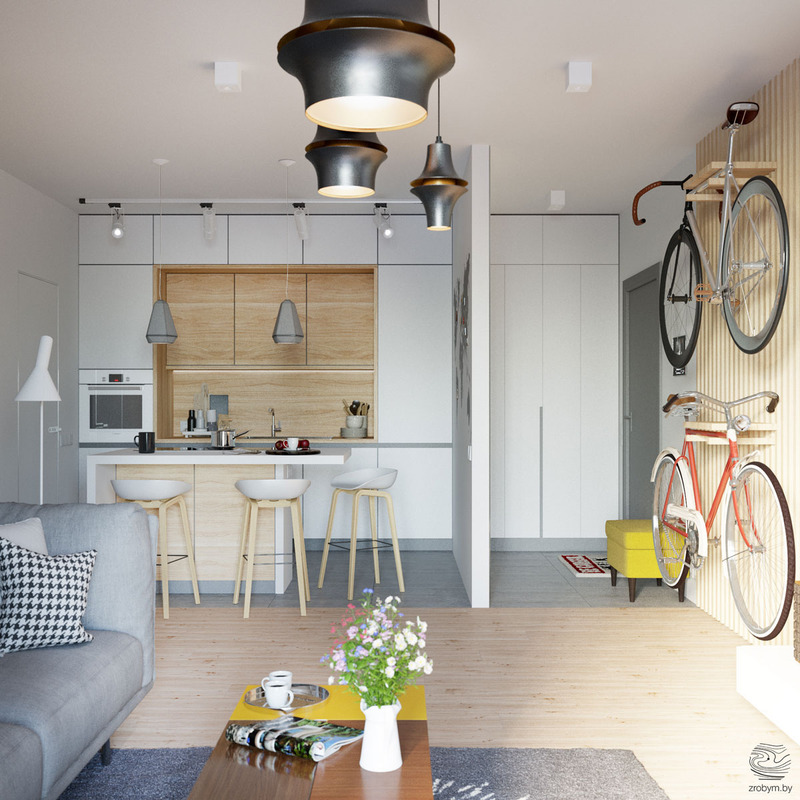 Bicycles that are wall-mounted indoors can be both a practical storage option and a decorative piece. Here they take pride of place on a wooden slatted backdrop, right next to the television. 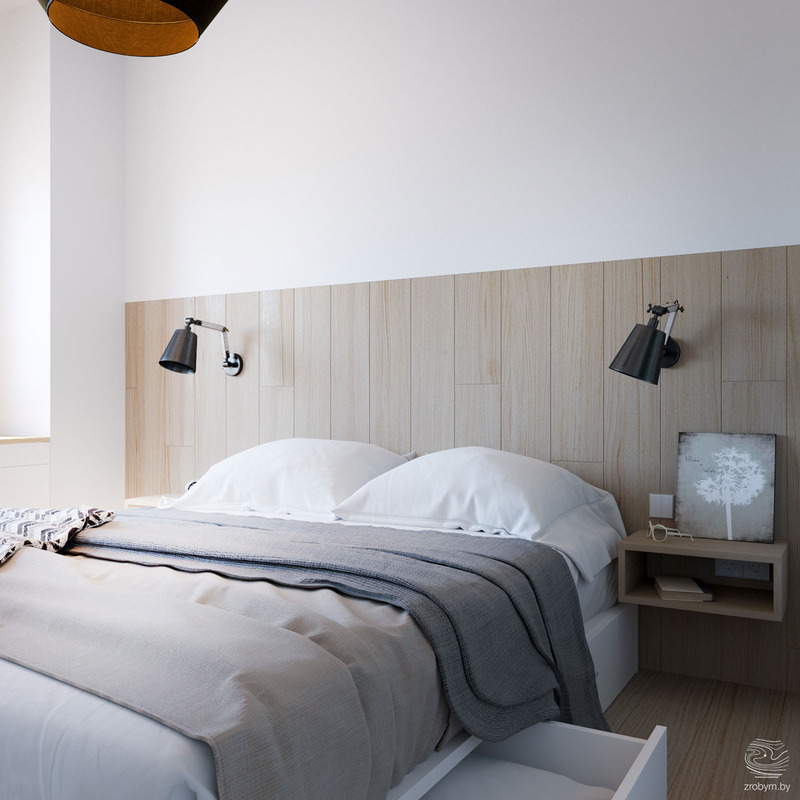 Three pendant shades of scaling sizes adorn the ceiling. The simple grouping forms a strong visual overhead. 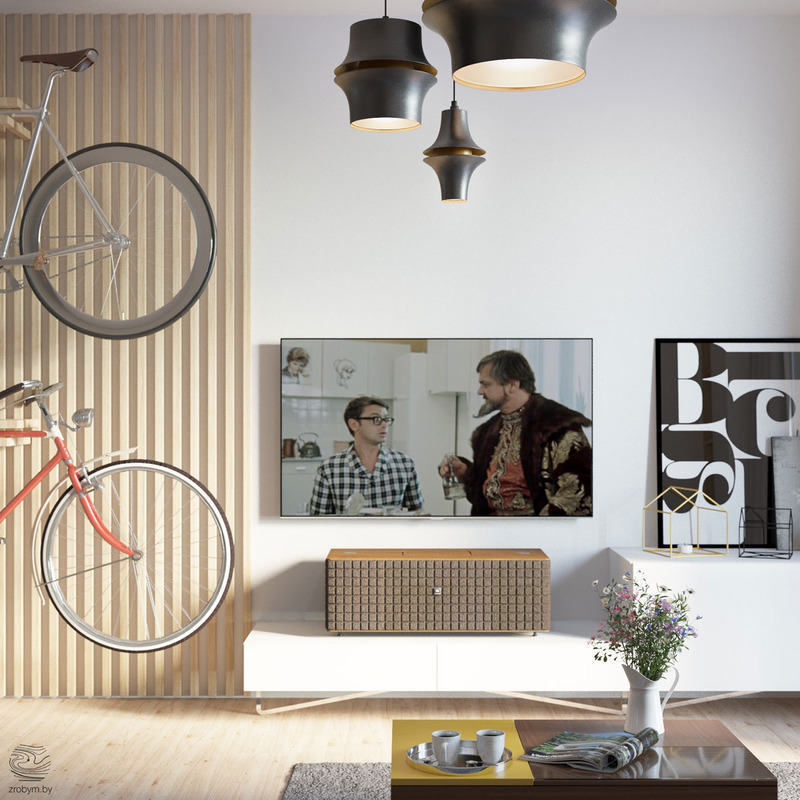 The sleek white entertainment unit is dual level, providing an optimum place for audio visual equipment and a higher platform for decorative items. 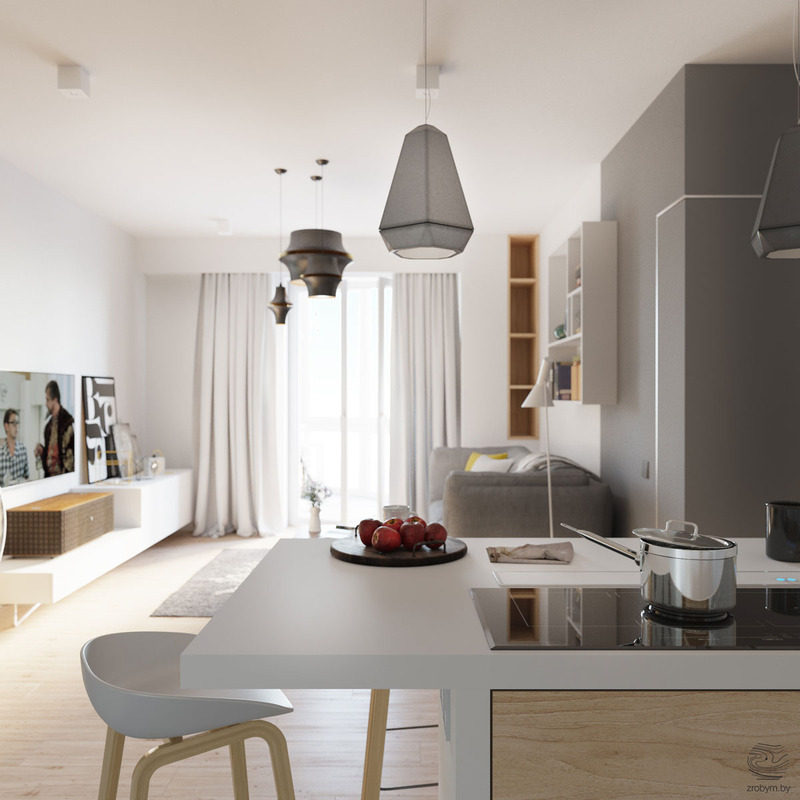 The living room runs right into the kitchen area in this small open plan flat. A change in flooring marks the transition between the two purposes. 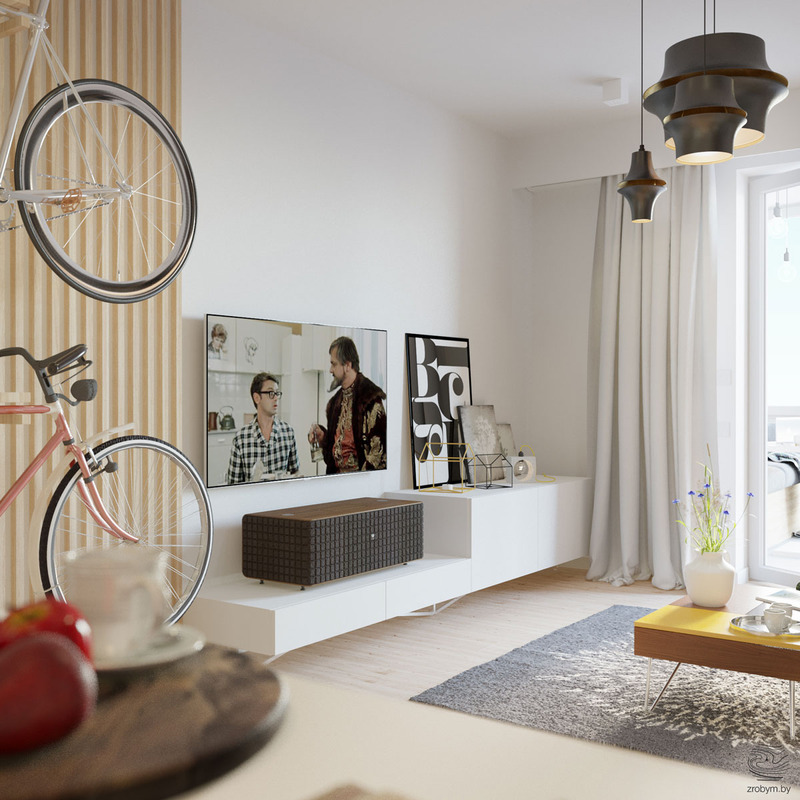 Each area uses the same colour palette of white, wood tone, soft grey and yellow. to keep the look clean and cohesive. 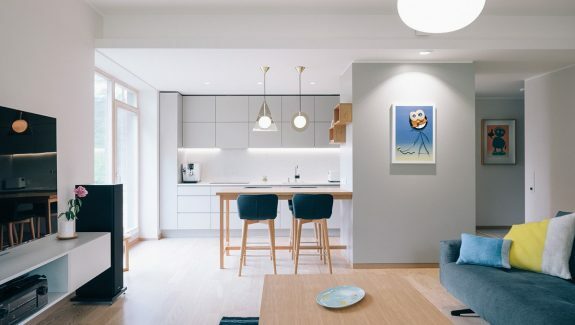 The countertop on the central kitchen island extends beyond the edge of the units to form a breakfast bar, the only eating area in this small apartment. 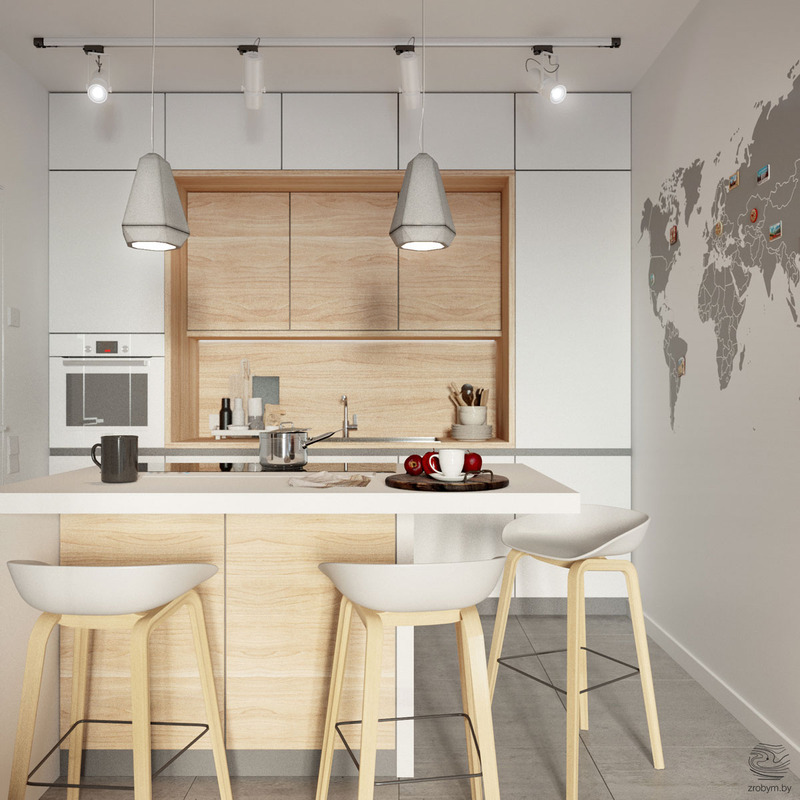 Two soft grey kitchen pendant lights illuminate the dining and cooking zone. Their colour ties in with that of the lounge, and with the adjacent mural on the partially dividing wall. Three kitchen stools sit in audience to the culinary show going on at the hob. 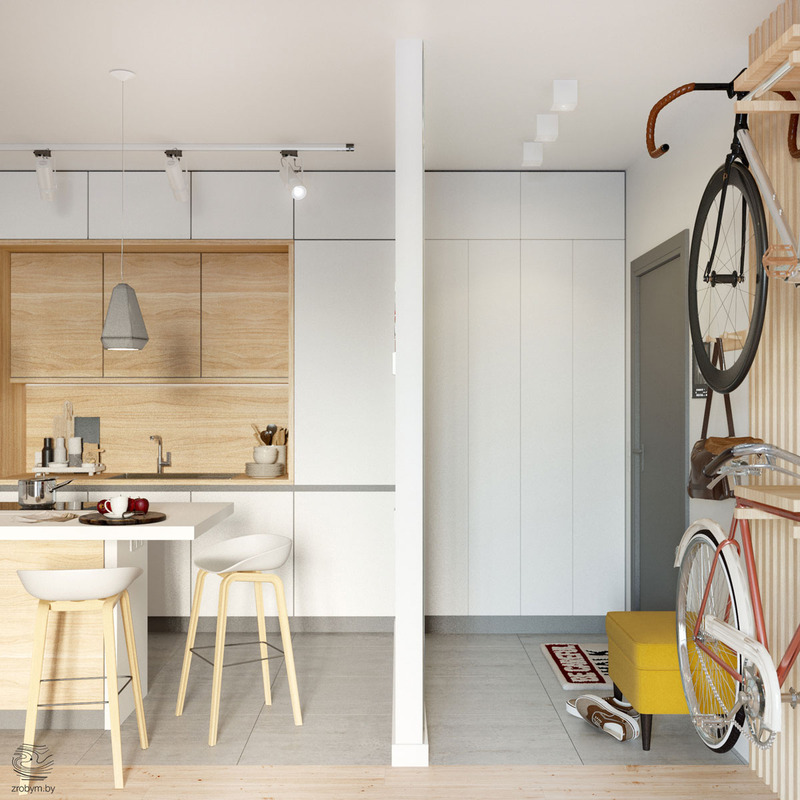 A thin dividing wall shields and separates the kitchen from the entryway. White units in the entryway mimic those used in the kitchen. A small yellow ottoman carries the accent colour through and provides a comfy seat for storing and putting on shoes. Wall hooks above the ottoman provide a handy place to hang up bags, hats and scarves by the door. 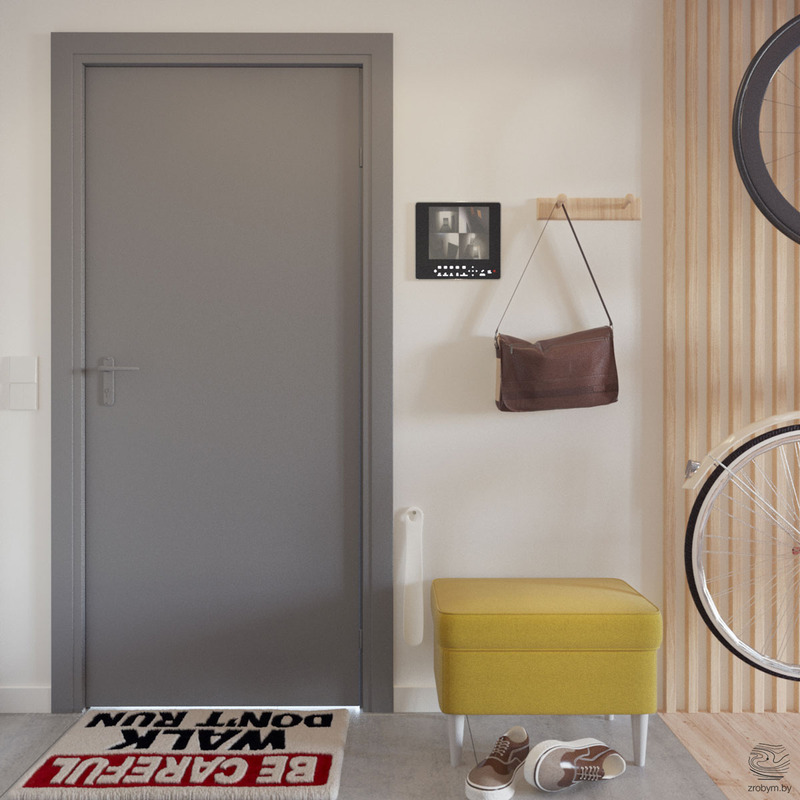 A typographical doormat brings another dash of humour to the home. The wall mural is a map of the world. A cool place to mark out your travel destinations from past trips, or future planned adventures. 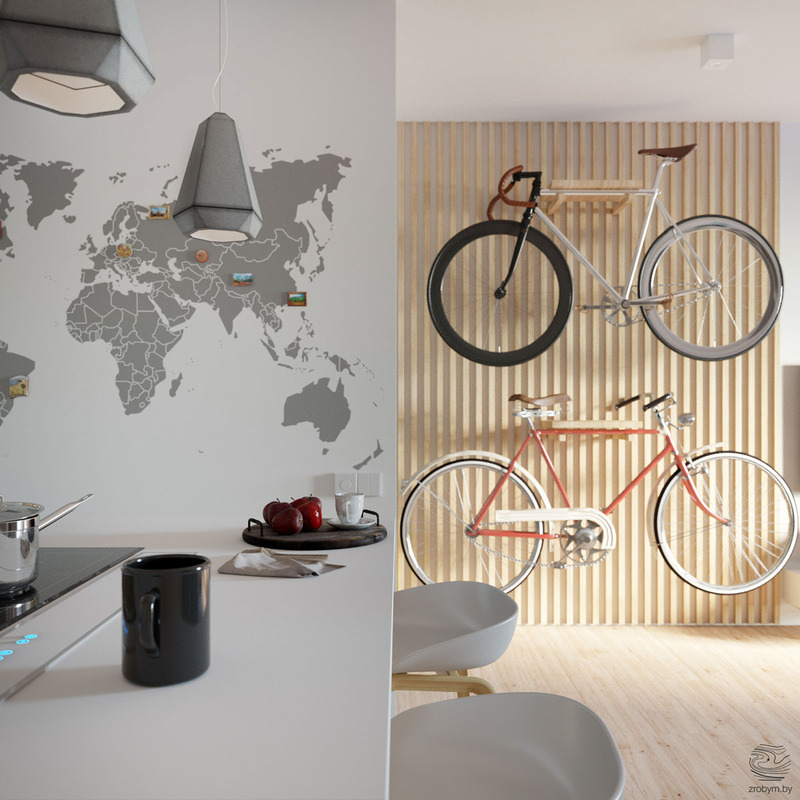 Magnetic paint provides an easily editable feature wall on which to display a rotation of favourite travel pictures or souvenir fridge magnets. 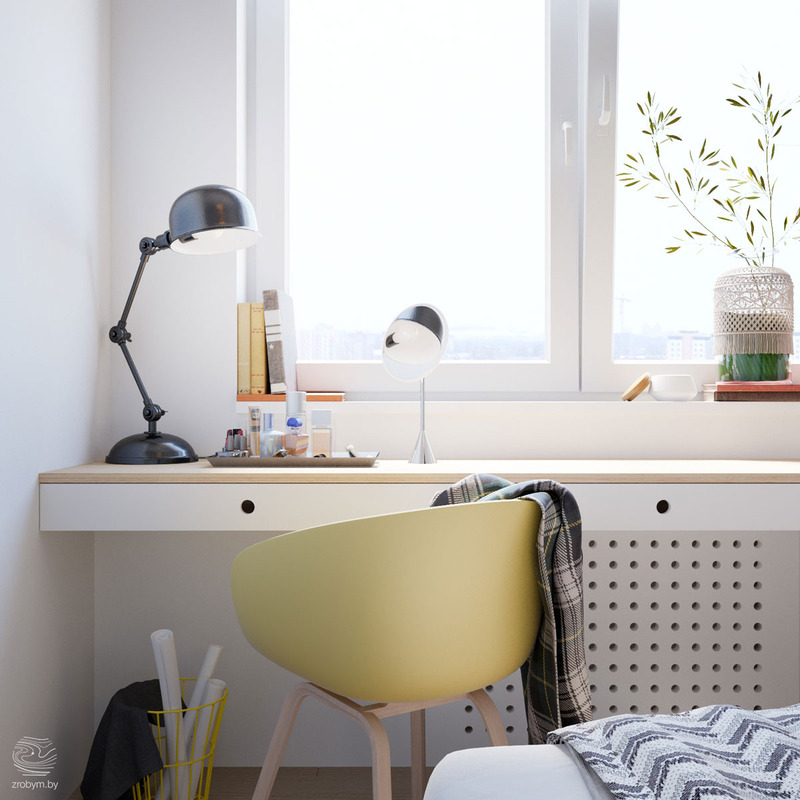 In the bedroom, a yellow stylish desk chair is tucked under a run of drawers to form a makeup table. An anglepoise table lamp provides extra light for glamming up. The bed linen is shades of grey to follow on from the colour story in the living room. 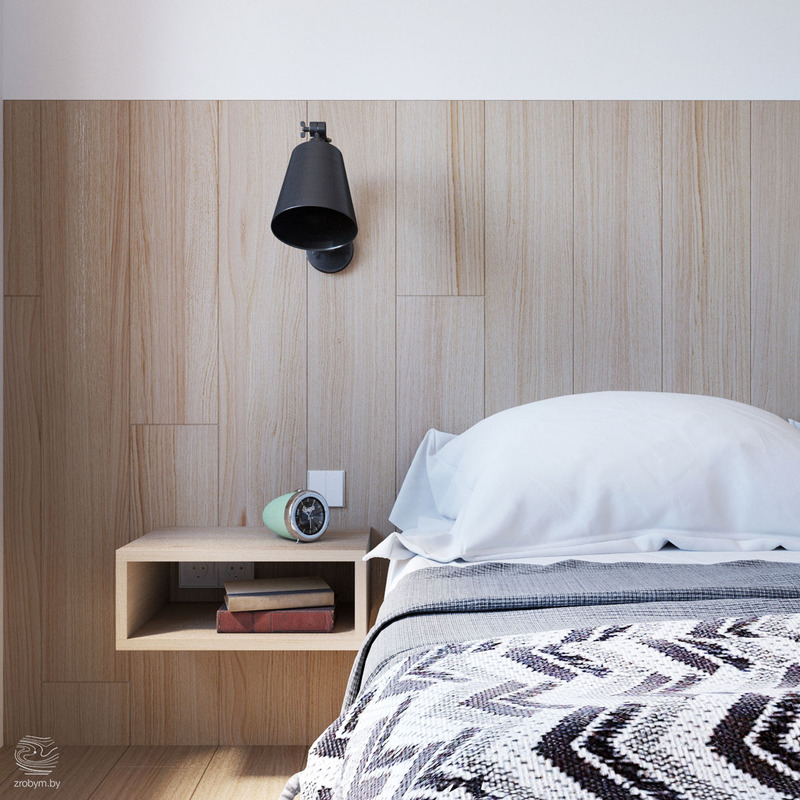 Two black wall sconces are fixed directly onto the wooden headboard to provide evening reading light. The two bedside shelving units are also headboard mounted. Underbed storage drawers offer another space-saving element. 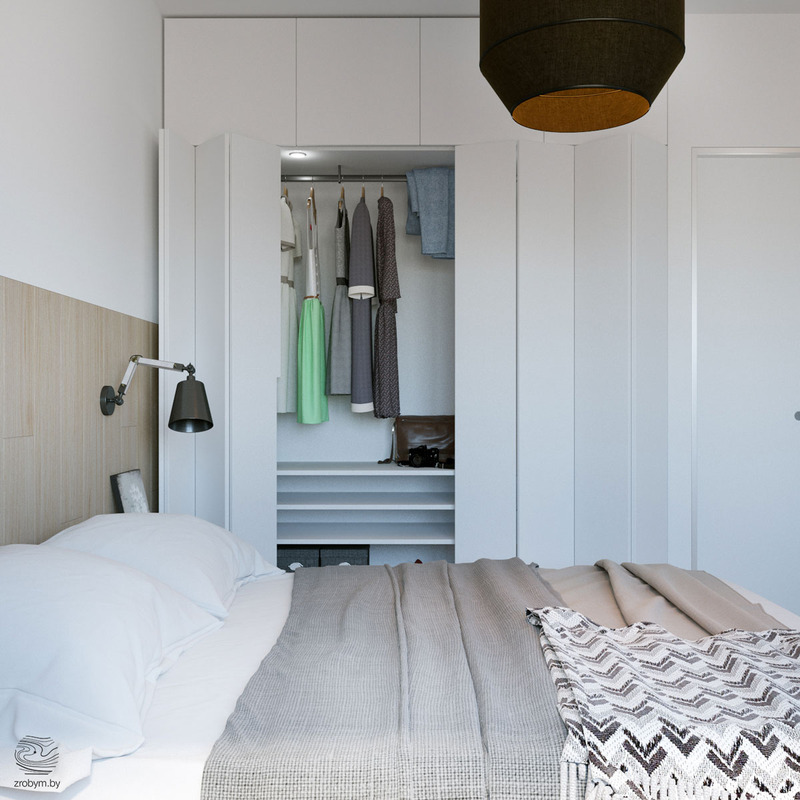 Slim paneled bi-fold doors on the wardrobe are perfect for a bedroom of limited space. 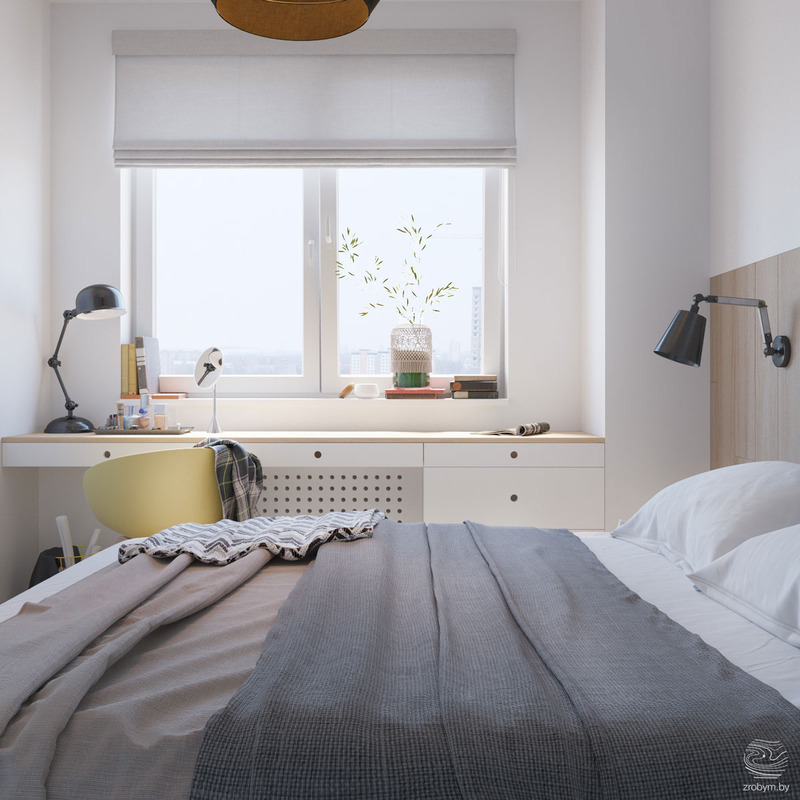 This allows the bed to be situated closer to the closet without the problem of regular sized hinged doors hitting the bed-frame when opened outward. On the bedside shelf, a mint green desk clock brings a tiny drop of colour into the mix. A black and grey chevron throw adds some bold pattern. 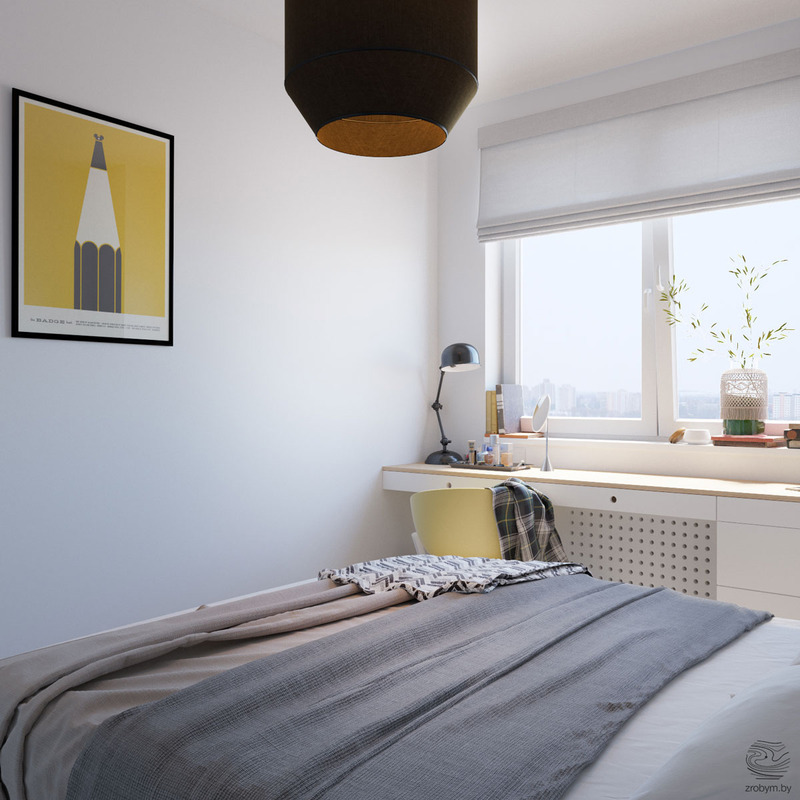 An art print includes another hit of yellow in this room. 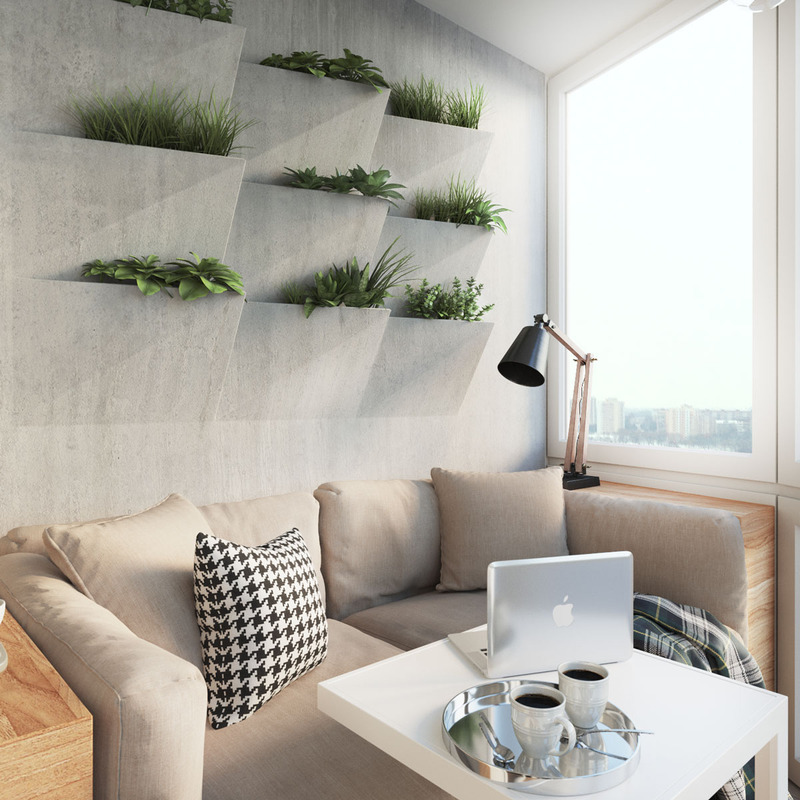 In this sitting area, indoor house plants peep out of a cool extruded wall feature. 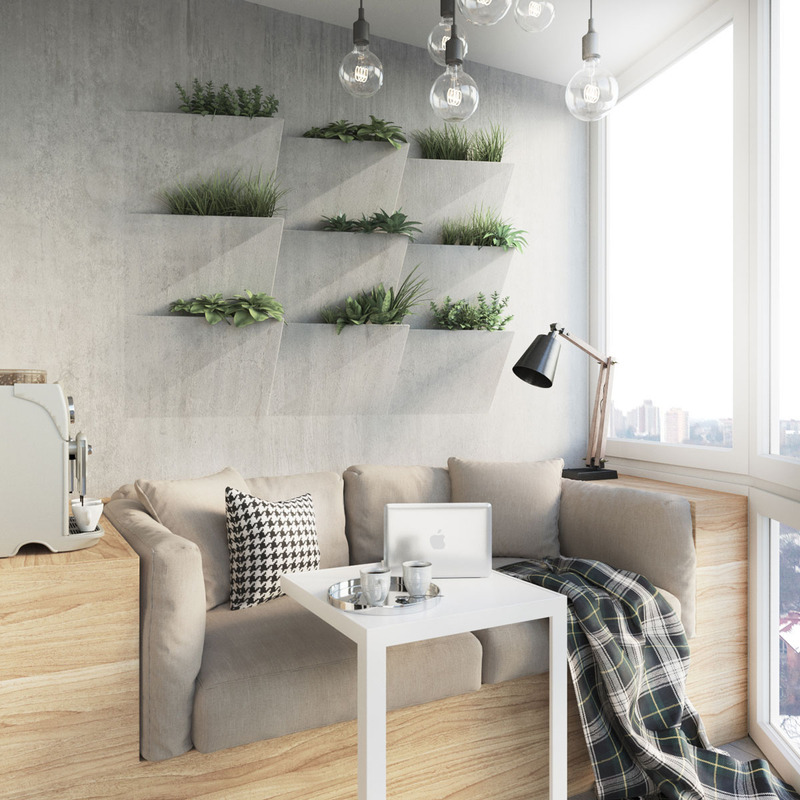 The seating here is a banquette that is built into a chunky wooden box frame. 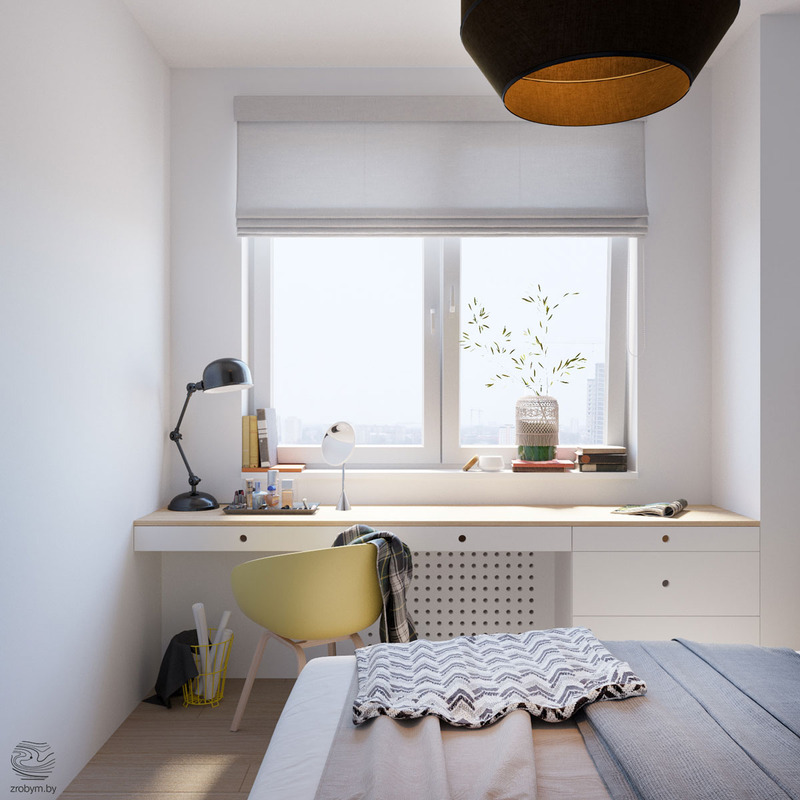 The boxing is deep enough to form shelves on each side, substantial enough to conveniently situate a coffee maker for on-hand hot beverages to fuel work from home. A houndstooth cushion and a plaid blanket provide some home comforts, and keep the chill off from the nearby large windows. 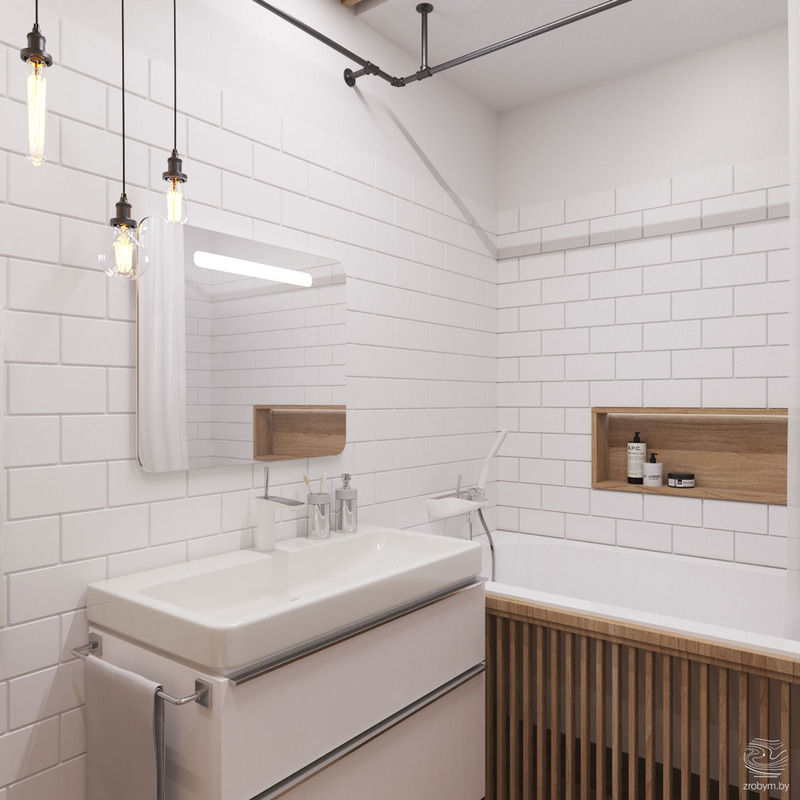 A grouping of industrial style lighting adds interest to plain white and wood bathroom decor. 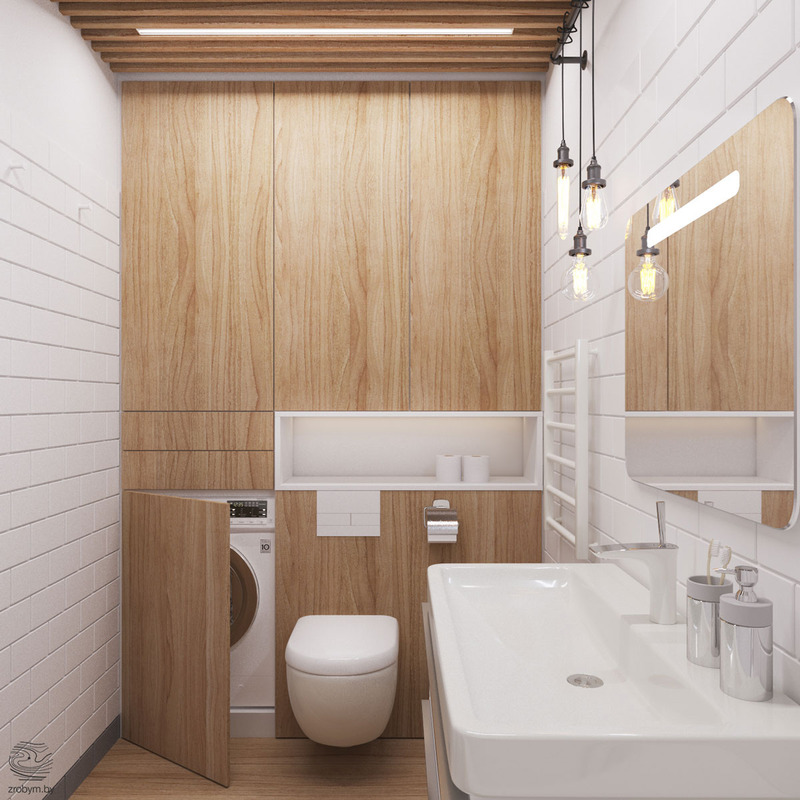 The wooden slatted bath panel matches with a letterbox cubby holding toiletries and soap dispensers. 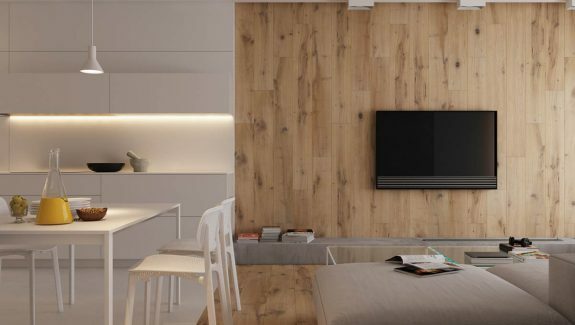 The wall opposite the bath tub conceals a washing machine behind handle-less wooden doors. 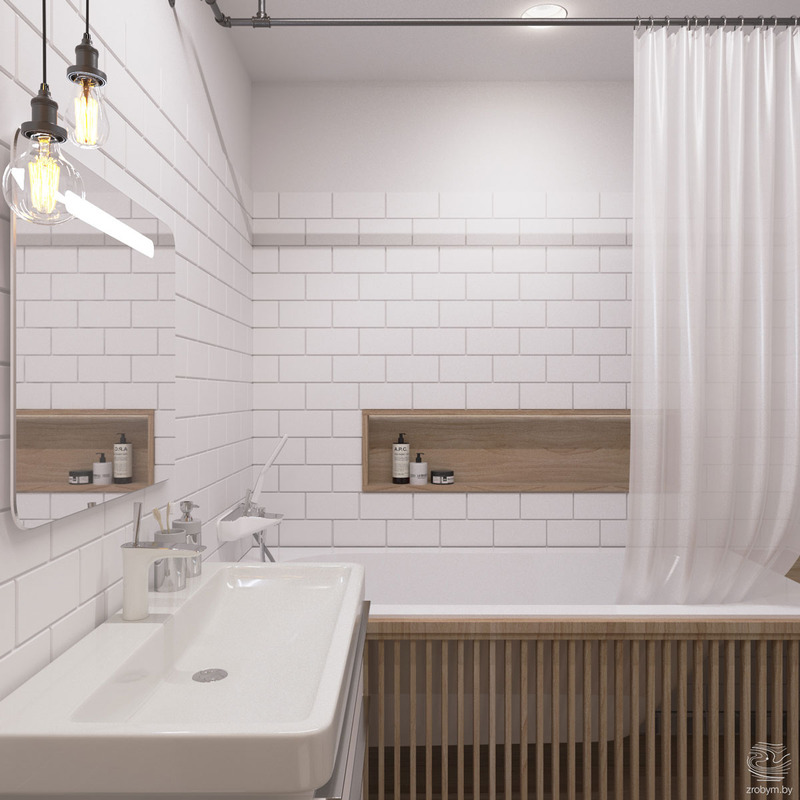 The industrial lighting mount is a continuation of the shower curtain rail. 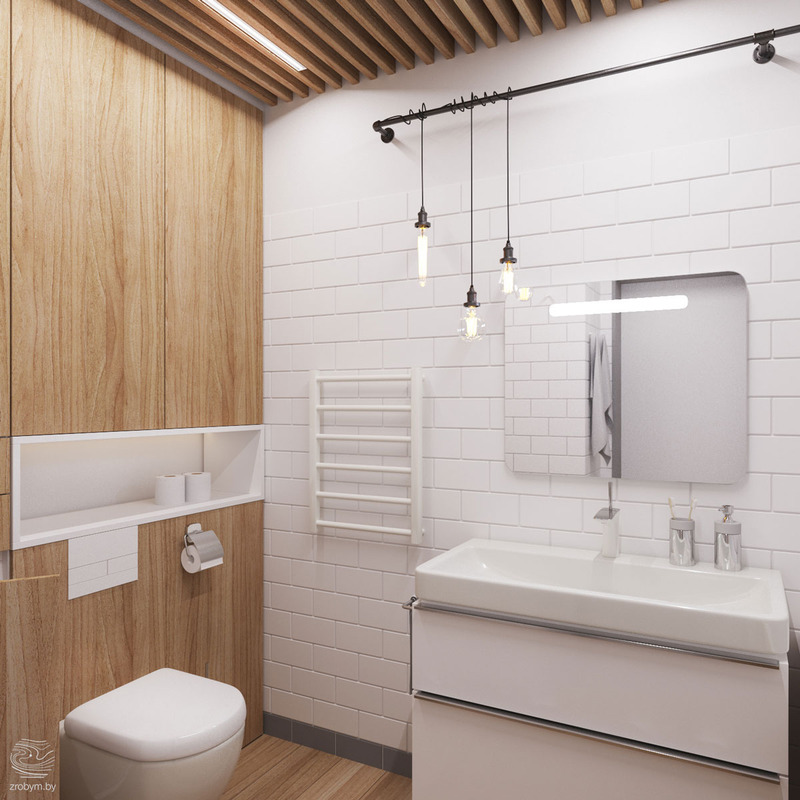 Additional strip lighting is situated between ceiling slats and an LED strip illuminates the mirror over the vanity. 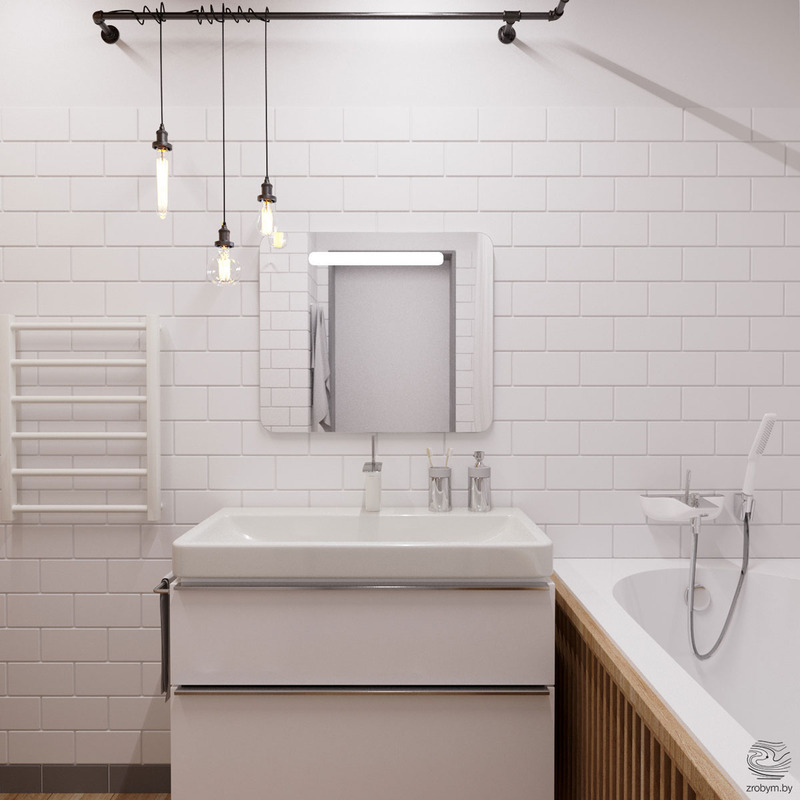 A small heated towel rail blends in with the white wall tiling behind, and matches the cubby above the toilet paper holder. The rectangular wash basin sits above a wall mounted vanity unit with storage. A waterfall tap completes the modern look.